KitLock is a digital access solution that uses a pin code to secure and open lockers and cabinets. Fitted in place of a standard cam lock, KitLock provides simple keypad access without the hassle of keys, tokens or coins. In our last blog post we briefly described the two different operating modes of a KitLock, promising further information this week. So, here is a more detailed look at the different modes and codes for using and programming a digital cabinet lock. A – Repeated use – this is where the same code is used over and over again. When you buy a new KitLock the lock comes pre-programmed with this function. This default mode is useful for applications where the locker or cabinet is regularly used by one person or by a small number of people. For example, this mode would be used on a student locker at a university or on a medical trolley in a hospital. B – Single use (locker mode)– this is where users select a new code every time the lock is opened. This function is used on lockers for short-term occupancy. Lockers in changing rooms in leisure centres, gyms and spas are typical examples. Master code: each KitLock comes pre-programmed with a factory-set master code. With this code you can open the lock, change the master code, set/change/delete the sub-master and user codes, select between repeated use and single use code, activate/deactive technician mode. The factory-set master code should be changed immediately after the lock is fitted. The master code is eight digits long. Sub-master code: this eight-digit code allows you to open the lock, change the sub-master code and set/change/delete the user code. The person in charge of a master code can delegate sub-master codes to people who need the ability to manage codes but not with full master-code access. So for example, a maintenance manager might delegate sub-master codes to relevant maintenance engineers. User code: using the four-digit code, the user can open the lock and also change their user code. 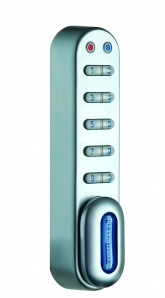 KitLocks are supplied with a factory-set user code, which again should be changed immediately after the lock is fitted. To programme the user code, the lock must be in the open position with the # button visible (on the KitLock 1000) or the codelocks.com badge bar visible (on the KitLock 1200). Every programme command must start by pressing either the # button or codelocks.com badge bar, followed by the master code, the sub-master code or the user code. For example in repeated use mode (A), to change the user code you would enter either # or codelocks.com, then insert the factory set four-digit user code and insert the new four-digit code twice. The new user code will now open and close the lock. Technician code: this six-digit code can be used when the lock is in single use or locker mode (B). It will open the lock without erasing the user code. It is useful in leisure centres, gyms and spas when a customer forgets which locker they are using and staff may need to quickly access several lockers to find the right one while leaving the user codes unchanged. You can download the full programming guides for KitLock digital cabinet locks on our website. If you need help using or programming your KitLock please call our technical support team on 0800 393405.